A few months ago I attended a class taught by Stacy Julian titled “Small and Simple Things” where she talked about how she used small things from her ancestors in everyday ways to keep their memories alive and to start conversations about their lives. This got me thinking about some of my favorite memories from my childhood and ways I could incorporate them into my life. One of my favorite things to do when I was young was baking (and actually, I still love baking!). My grandma was an avid baker, especially when fair time rolled around each year, and she shared this passion with her grandchildren by inviting each of us to spend a day with her baking. It started out that she would select the recipes for what we would make, but as we got older, she’d let us pick our favorites. I still have several of her recipes, some are typewritten and some in her handwriting, and randomly make them. And in fact, I pulled them out as I was thinking about this blog post. 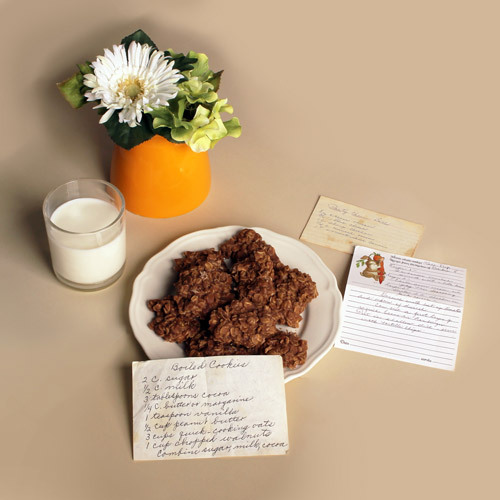 Funny thing, one of the recipes I remember Grandma making was No Bake Cookies, but I could not find that recipe. The reason? She called them Boiled Cookies. Funny how names change over time! I made a batch and shared them with my co-workers and we talked about the recipe name and what it was in their family. This brought up a new question: what was the best way to preserve the handwritten recipe cards. Two options came to mind. One, scan the recipe cards and include them in a book. Two, include the cards on a traditional scrapbook page (using photo corners to hold the cards for easy removal). The scan option was quick and easy – select a template (the flip book is the perfect size), scan the recipes, create, and print! And there are several templates for flip books, including this Holiday Recipes one that you can easily swap out the papers for non-holiday versions and voila, a custom way to share your family’s favorite recipes. So what are some of the things you remember about your relatives? What are you doing to bring them into your life? I’d love to see and hear your stories.